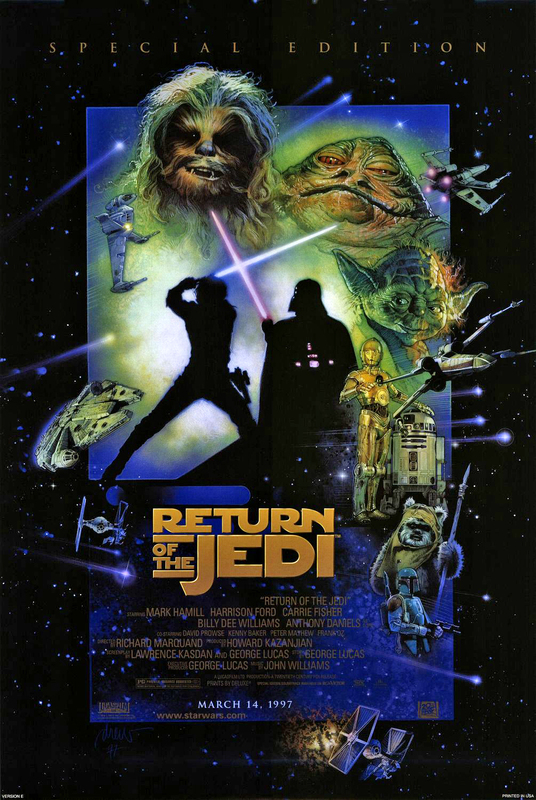 The special edition of Star Wars: Return of the Jedi was released on this day in 1997. The film was released as a part of a theatrical anniversary edition of the Original Trilogy, in order to celebrate the 20th anniversary of the release of Star Wars: A New Hope on May 25, 1977. Minor changes were made to the digital remastering to the image and sound through extensive clean-up and restoration work. The special edition of the Original Trilogy was shown in the USA from January to March 1997, with a monthly interval between each. Return of the Jedi was originally scheduled to premiere in movie theatres on March 7, 1997 but was pushed a week later on March 14. The aim of the re-release was to renew the movies in minds of older and younger audience members in time for the upcoming screening of Star Wars: Episode I - The Phantom Menace.